Franklin Township Hall is located at 2093 Route 57, Broadway NJ 08808; phone: 908-689-3994. 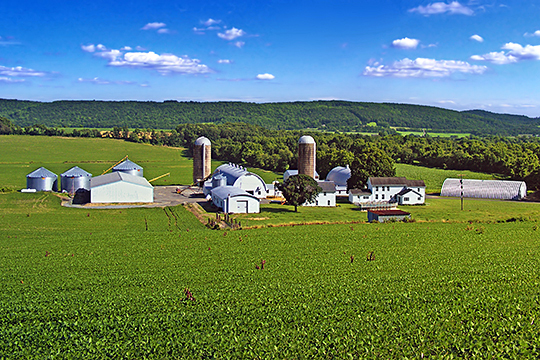 Photo: Farmstead, Franklin Township, Warren County, NJ. Photographed by User:Nicholas (own work), 2009, [cc-by-2.0 (creativecommons.org/licenses/by/2.0)], via Wikimedia Commons, accessed April, 2013. Evidence of their presence in the valley was documented at the Plenge Site, which is located near the village of Asbury in Franklin Township. The Plenge Site was the first of only two major Paleo-Indian archaeological site excavations in New Jersey, and it is considered to be one of the most important in the northeastern United States. The Plenge Site is eligible for National Landmark designation study. Gradually, over thousands of years, climate moderated, eastern deciduous forests evolved and the Musconetcong River decreased to roughly its current size. The Leni Lenape Indians that settled along the rivers and streams of the region for thousands of years were declining in numbers, when European settlers arrived during the early 18th century. The area of Warren County, which would later become Franklin Township was settled around the year 1740 by Scottish, Irish and German immigrants. Subsistence agriculture took root and the fertile limestone valleys were cleared for croplands. Eventually, subsistence agriculture evolved into commercial grain and dairy farming. It was in 1839 that the New Jersey General Assembly passed an act, which incorporated the Township of Franklin, in honor of Benjamin Franklin, from parts of Greenwich, Oxford, and Mansfield Townships. It was in 1796 that a prominent landowner and businessman, Colonel William McCullough, was instrumental in having the village's name changed in honor of Bishop Francis Asbury who was a founder of American Methodism and who laid the cornerstone of the Methodist Church in the village. Asbury continued to grow during the early 1800's and expanded even further when the Somerville-Easton railroad extended its tracks and established a stop just south of the village in Hunterdon County. This station served as a passenger stop until 1970. Morris Land Conservancy with the Township of Franklin Environmental and Open Space Commission, Open Space and Recreation Plan for Township of Franklin, County of Warren, January 2006, www.franklintwpwarren.org, accessed April, 2013.